It’s time for Arizona to stop being the brunt of jokes on Comedy Central and time to close the Meth Lab of Democracy. 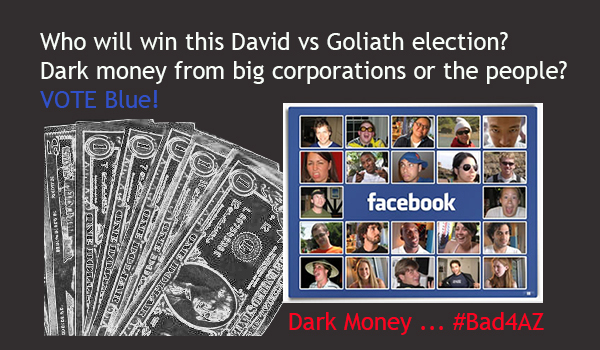 Meth– like dark money from the Koch Brothers, ALEC, and Arizona Public Service– is addicting and #Bad4AZ. We need politicians who are clean and not addicted to or swayed by dark money. 1- Vote for Fred DuVal, Terry Goddard, Felecia Rotellini, David Garcia, Jim Holway, Sandra Kennedy, Ron Barber (or Raul Grijalva, Ann Kirkpatrick, Mikel Weisser, or James Woods, depending upon where you live), and your Legislative reps (like Victoria Steele, Randy Friese, and Steve Farley) if you haven’t done so already. 2- Vote “No” on Props 122 and 303 because they are all about challenging the federal government and sparking new costly and unnecessary lawsuits. 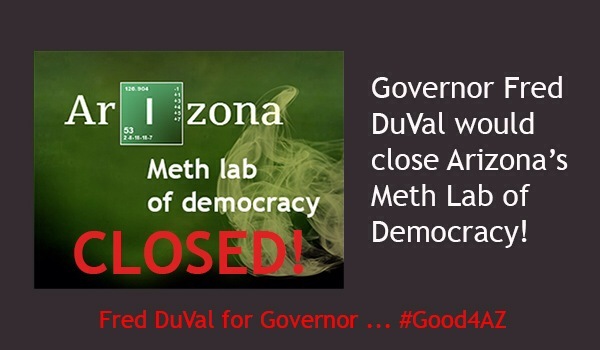 Not #Good4AZ. 3- Vote “Yes” on Prop 415 to build the new animal shelter. It’s only $3/year to treat animals humanely. 4- Take your early ballot to your polling place if you still have it. Volunteer to drive friends to the polls or to drop off their mailed ballot. 5- Ask everyone you see if they have voted and encourage them to follow steps #1, #2, #3, and #4 if they have not. 6- If you have adult children, contact them and encourage them to vote. 7- If you’re on social media, follow and re-Tweet the memes and blog posts going out from @BlogForArizona, @Bad4AZ, @Good4AZ, @P2Hannley, @DonnaDiva, @AZProgressives. Also, check out coverage at Tucson Progressive on Facebook and Blog for Arizona on Facebook. 9- After 5 p.m., have a quiet dinner with your family and relax. 10- After 7 p.m., come down to the University Marriott in Tucson or the Renaissance Hotel in Phoenix to watch Democrats spank the Tea Party! If you need a ride or have a voting issue in Pima County, call the Democratic Party HQ at 520.326.3716. 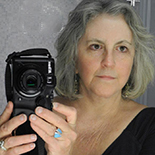 This entry was posted on November 4, 2014 by Pamela Powers Hannley in 2014 elections, Ann Kirkpatrick, Arizona, Arizona Legislature, Capitalism, Congress, democracy, Democratic Party, Doug Ducey, downtown, equality, Fred DuVal, gun control, organizing, Raul Grijalva, Republican Party, Ron Barber, Steve Farley, taxes, Terry Goddard, Victoria Steele, Voter Suppression, War on Women and tagged 2014 elections, Arizona, David Garcia, Felecia Rotellini, Fred DuVal, Raul Grijalva, Ron Barber, Terry Goddard, top 10, top 10 reasons.